Our VAC Bearing Sets: Precise construction and special coating to keep bearing failure at a minimum. Reap lower temps and less friction in your expensive BMW engine! The mighty and powerful BMW S65 has an "Achilles Heel", it's rod bearings. As great and powerful as BMW made the S65 engine, they left it lacking in a critical area - it's rod bearing reliability. Now one of our best sellers has gotten even better! 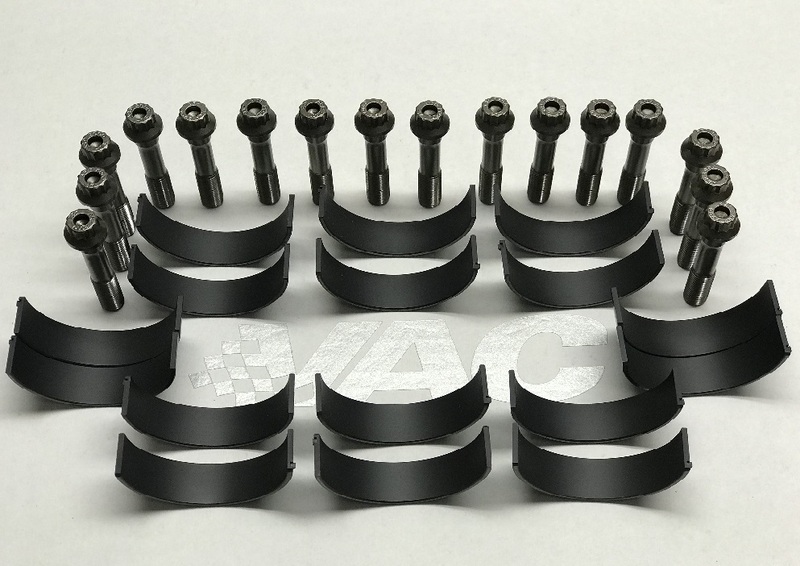 With a VAC Motorsports' complete High Performance Coated Rod Bearing Kit, you get all the parts you need to easily swap out the factory connecting rod bearing shells and bolts in one simple kit. Our S65 bearings are embraced by BMW engine builders world wide. Popular for both forced induction and N/A builds, our coated bearings are "friction resistant" making thermal breakdowns that can occur due to lack of lubrication a much less common occurrence. Helping to prevent premature engine failures on street cars, and spun bearings under stress at the track when things are most critical. Proven by customers to help you finish the race even with loss of oil pressure! Q: Do I need VAC Bearings? A: Unfortunately, you might... BMW will not disclose their logic as to why the build engines the way they do. Its up to engine builders such as ourselves to come up with ways to improve something with millions of dollars of R&D. S65s experience rod bearing wear on both street and track cars. See the used oil analysis image provided by a customer who is experiencing rod bearing failure under normal driving conditions! Even normal street engine use is leading to bearing failure at a much higher rate that expected. Q: Why do VAC bearings do a better job? A: Our bearings are not only made with great precision and repeatability, but their coating is widely praised as one of the best upgrades on the market. Its a physical layer (not just a treatment to the layer) with both a high embedability factor, and a 'dry lubricant' property. What makes them so good is that they can run tolerances that BMW engines like and not see the typical failures that one associates with the OEM units. Unlike treated bearings that must be sized very close to OEM for proper results- these bearings have the ability to run well on both sides of engine tolerance and work fantastically for cold starts that street engines see, and race engines as well. All VAC engines are built with our coated bearings and we know they work great. VAC Bearing Sets: Precise construction and special coating to keep bearing failure at a minimum. Reap lower temps and less friction in your expensive BMW engine! The mighty and powerful BMW S65 has an "Achilles Heel", it's rod bearings. As great and powerful as BMW made the S65 engine, they left it lacking in a critical area - it's rod bearing reliability. Now one of our best sellers has gotten even better! With a VAC Motorsports' complete High Performance Coated Rod Bearing Kit, you get all the parts you need to easily swap out the factory connecting rod bearing shells and bolts in one simple kit. Our S65 bearings are embraced by BMW engine builders world wide. Popular for both forced induction and N/A builds, our coated bearings are "friction resistant" making thermal breakdowns that can occur due to lack of lubrication a much less common occurrence. Helping to prevent premature engine failures on street cars, and spun bearings under stress at the track when things are most critical.